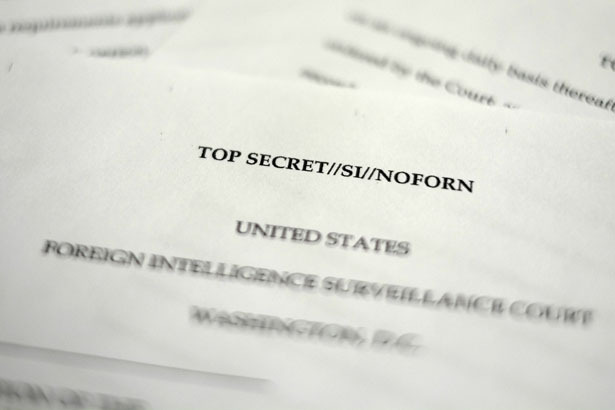 The NSA spying is legal--and that’s the real scandal. While the document Greenwald obtained only relates to a ninety-day period, ending July 19, and only involves Verizon Business Services clients, it’s very likely just a snapshot of a much broader data-gathering effort by the NSA. In 2006, USA Today reported that the NSA was vacuuming up the call data of tens of millions of Americans, from several different major carriers. Greenwald’s story confirms that this effort continues today, and it would be extremely surprising if the effort was only limited to one service offered by one carrier. The order does not give the NSA permission to eavesdrop on phone calls, but does give them access to so-called “meta-data.” This means the NSA has a massive database of phone numbers and the serial number of the phone associated with it; which other phones it contacts and for how long;and potentially the geographic location of the user. Most of Wyden’s colleagues, however, don’t appear to share his outrage, nor does the White House. Senate leaders and administration officials have mounted a multi-pronged defense of the spying program: (1) that it’s crucial to protecting the country from terrorist attacks, (2) that it’s essentially harmless because it doesn’t collect your name nor listen to your communications, (3) that it’s been going on for years, and that (4) don’t blame us, because the other branch of government knows about it too. It’s worth probing these claims in a little detail. The primary claim here is that we need this program to keep us safe. “The information of the sort described in the article has been a critical tool in protecting the nation from terror,” White House spokesperson Josh Earnest told reporters on Air Force One today. As you know, and I’ve pointed out many times, there have been approximately 100 plots and also arrests made since 2009 by the FBI. I do not know to what extent metadata was used or if it was used, but I do know this: That terrorists will come after us if they can, and the only thing we have to deter this is good intelligence. So, the massive metadata sweep is key to stopping terrorist plots—except we don’t know if it’s actually ever worked. Representative Mike Rogers claimed later in the day that the NSA program has disrupted a specific domestic terror plot, but couldn’t reveal the details. Defenders of torture under President George W. Bush often made ultimately unsubstantiated claims of its efficacy, so it’s worth treating these claims lightly until more details come out. But moreover, even if it has “worked,” can the government justify the program? Senator Saxby Chambliss, ranking member of the intelligence committee said Thursday that “we have gathered significant information on bad guys, but only on bad guys, over the years.” But that’s clearly not true—tens of millions of records are being collected. “The president welcomes a discussion of the tradeoffs between security and civil liberties,” Earnest said. Ideally, Greenwald’s story will spur that conversation. The next point made by government officials is that the program is more benign than civil libertarians assert. “The order reprinted overnight does not allow the government to listen in on anyone’s telephone calls,” Earnest said. “As you know, this is just metadata. There is no content involved. In other words, no content of a communication,” Feinstein reminded reporters. This directly contradicts the efficacy argument, however—either the program works at ferreting out individuals and their communications, or it doesn’t. The final arguments are that the program is legal, and thus not scandalous. Also, proponents argue that it has been approved by all three branches of government, which serves to spread the blame around and limit political fallout. This is a little confusing. It’s legal because these lawmakers made it so. As Marcy Wheeler notes, there were several attempts—most recently in 2011, led by Wyden—to reword Section 215 of the Patriot Act so that it was much more restrictive, and couldn’t be used to create a data dragnet. But a majority of members of Congress, of both parties—and backed strongly by the administration—quashed these efforts. At the heart of the controversy, then, is why it’s legal, and if it should be. The Progressive Change Campaign Committee has launched a drive to re-examine the matter, and Representatives John Conyers, Jerrold Nadler and Bobby Scott have already called for hearings. Read John Nichols on the need of senators to step up to defend privacy rights.